I love a good cooking programme but often find that the recipes that some of these TV chefs come up with are rather indulgent on the calorie front. This Gino D’Acampo recipe was no exception with over 100g of butter in the original. Nevertheless my mouth was watering as I watched Gino cook up this treat. 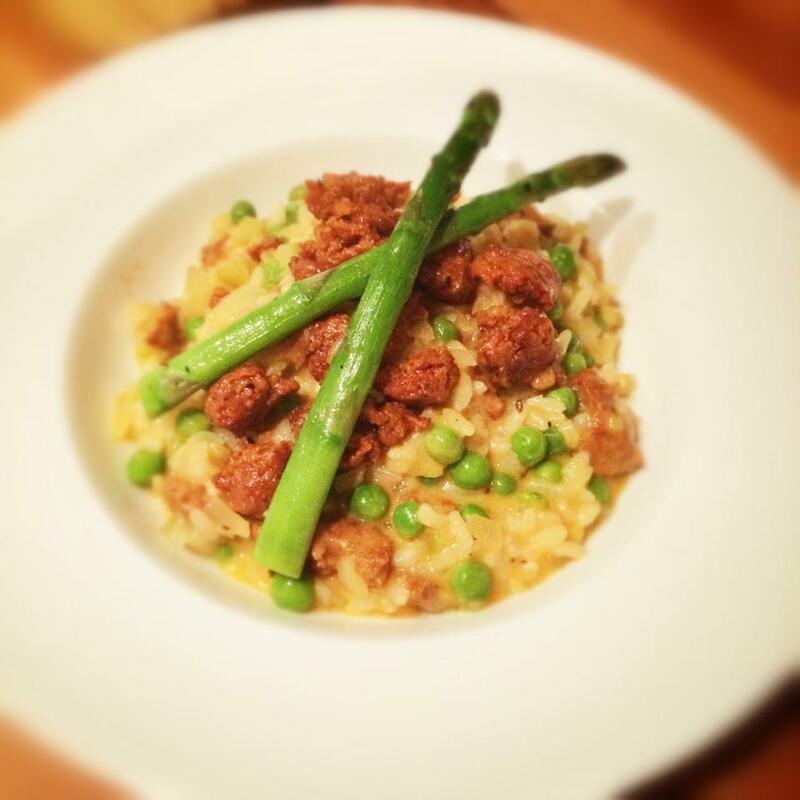 I love a risotto and love to find new ways to use sausage meat so I knew I had to give this recipe a go by adapting it. The original recipe can be found here however as I say, Gino uses rather a lot of oil and butter, as well as Italian sausages and radicchio, neither of which I could find in my local Morrison’s (use them if you can find them!) so I made a few of my own adaptations and additions. The result was outstanding, easily the nicest risotto I have tasted (and better than the one I paid £9 for on Saturday night!). The key to this recipe is to find some high meat content, good quality flavoured sausages. Your local butcher is often a good place to start but failing all else, Sainsbury’s have a great selection. Spray a large heavy based frying pan with 1kal and place on a high heat. When hot, add the sausage meat and fry, using a wooden spoon to break up the meat into small pieces. Continue to fry until the sausages are a nice golden brown, then transfer to a plate. In the same pan, heat 1 tbsp of oil and once hot, cook the onion and celery for 2 minutes, then add the rice and fry for 3 minutes on a medium heat, allowing the rice to toast into the hot oil. I don’t usually use much oil in my cooking however in risotto I think it’s essential to ensure you get the right texture for the rice. Stir continuously with a wooden spoon. Pour the wine over the rice and continue to cook for a further minute to allow the alcohol to evaporate. Add a couple of ladles of stock and bring to a simmer. Continue to cook and stir until all the stock is absorbed. At this point keep an eye on the pan as you need to keep stirring with a wooden spoon to make sure nothing sticks to the pan. Pour in the rest of the stock a little at a time, cooking until each addition is absorbed. You will know the rice is cooked when all the liquid has been absorbed and the rice is cooked but still has a slight bite. This takes around 20 minutes (and be careful, you may not need all the stock). When the rice is cooked, add the peas and simmer for a few minutes until the peas are cooked through. While the peas are cooking, pop a griddle/frying pan onto a high heat and spray with 1kal. Pan fry the asparagus until cooked to your liking, seasoning well with salt and pepper. We like them crunchy so I usually give them 3-4 minutes. Chop up the majority of the asparagus, reserving a few tips per person to garnish and mix the rest through the risotto. Pop the sausage back into the asparagus frying pan for a minute to heat through and then add three quarters of the sausage to the risotto mix. Remove the pan from the heat and stir in the butter and Parmesan. Season to taste. Serve the risotto in nice big bowls and top with the test of the sausage, the asparagus left over for garnish and a twist of freshly ground black pepper. Hi Laura – this was delish!!!! I was looking for a different way to use up the asparagus in the garden as we have had a really good crop this year. One thing – I wish there was a way to bookmark favourite recipes on here … or am I being dim? Thanks again – love your stuff!